One large sofa pillow bit the dust the other day. Once again a subject was chosen due to the spectacular mess it leaves when destroyed. 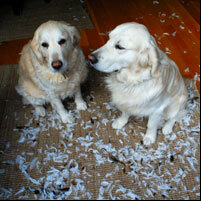 Dogs unaware of the destruction around them. Well, Jack did seem a bit proud for the rest of that evening. This entry was posted at 10:15 PM. so are they your pet dogs the two of them?